Well, I did my first official smokin’ hot sweaty run in the city today. I think the temperature was closing in on the 90’s but I don’t really want to know because if it really was only low 80’s I really might combust on our next run!! NYC in the summer can be unbearably hot, the concrete jungle absorbs the heat and it can feel like you are in a walled in sauna. And, let’s not even talk about the smells… But, I am determined to keep up my running this summer. So determined that I signed up for a 1/2 marathon in Philly in September. I know, only a truly crazy person (and her running friends) would sign up for a 1/2 marathon to motivate themselves to run throughout the summer. Insane. Maybe the heat really has gotten to my brain!! 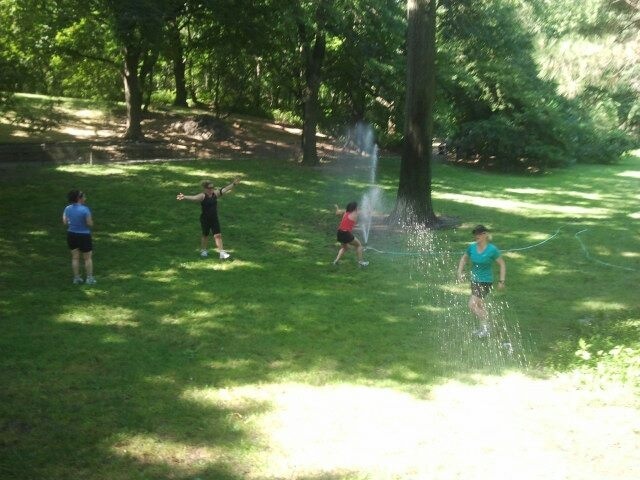 A post- run cool off through the sprinklers in Central Park! Good for you! Makes me miss you guys!!! Come on up here for a run in the woods!! !